The subject of this sketch is a splendid sample of the off-spring of Northern Primitive Methodism. He was born at Seghill, Northumberland, on September 8th, 1855, and at the age of five he removed along with his parents to Lemington-on-Tyne. From the first his parents associated themselves with the Primitive Methodist Society there, worshipping in what was then known as “The Old Engine.” The teaching of the Sunday school and the preaching of the Word did much to hasten William’s conversion, but the most potent factor in the “great decision” was the religious influence of his home life. Its atmosphere was morally healthy and religiously contagious. The sure result was that the youth longed to be a Christian. Thus nursed into the Church by the gracious influence of his home, it was comparatively easy for him, at the age of twelve, to make the decision for Jesus Christ at the special services held in Bell’s Close Wesleyan Chapel. Immediately after his conversion he connected himself as a member with our own Society. Still, there was no slackening of the earnest interest in his spiritual welfare on the part of his parents. In this they were determined that he should be kept under the influence of the Church, and that he should not be allowed to wander from it. From the first Mr. Nichol seems to have had no shallow conception of the Christian life. He at once began “abounding in the work of the Lord.” His coming, as he did – especially in his home – under the influence of many of the old ministers and local preachers, acted as a stimulant to his anxiety to serve his Master. The late Rev. Peter Clarke took a very deep interest in him, and William would accompany him night after night to revival services which he was conducting in the neighbourhood. Are we not here near the very springs of the evangelistic zeal for which our brother is so well known? And who shall say that the saintly man had not another idea, as he took the youth with him, viz., that William should rank as a minister in Primitive Methodism? There were, indeed, desires on all sides that he should enter the ministry, but just when “the tide was at the flood,” and the time for final decision had come, he was broken down in health. 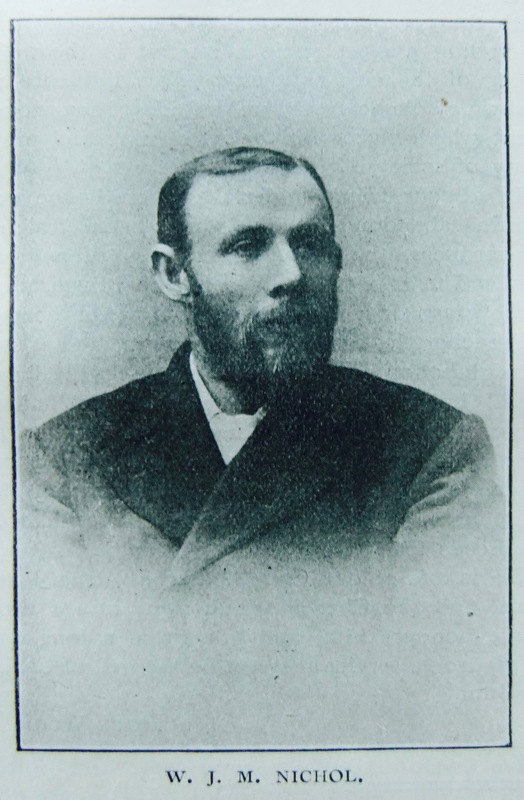 The year 1876 saw his removal from Lemington to Gateshead, where he had much to do with the establishing of the Teams Mission, which has since developed into the present prosperous church at Victoria Road. In and around Gateshead he became widely known and deservedly appreciated. In Leeds, to which city our friend removed in 1885, Mr. Nichol has been able to render herculean service for his Lord. As a preacher, Mr. Nichol has always excelled. While not weak on other points, he is exceedingly strong on this. In his youth he had few advantages (he was at work when ten years of age in the glassworks at Lemington), and since then his life h.as never been anything else but a busy one. Yet his sermons are evidently most carefully prepared. He endeavours to give, and, as we think, succeeds, an intelligent presentation and application of evangelical truth to the life of to-day. There is no lack in his sermons of the evangelistic message, yet in all of them there is a distinctive ethical element. In his judgment the Christian creed must he allowed to shape character. Religion must be translated into the deeds and spirit of the common day. In all his relations to the pulpit there is a beautiful blending of responsibility with delight. He has an unchanging interest in whatever bears on the heralding to men of the good news from God. He has the gift of “seeing” in the circumstances of our working day illustrations of the truths he proclaims. Most of the currents of his life are made to converge in his one supreme and central purpose. And thus, with the many natural gifts possessed by him – an excellent voice among the most obvious – he is sought after from far and near. At present his work lies throughout the length and breadth of Yorkshire. In Leeds there is a sense in which he belongs to all the Nonconformist churches. There are few churches in the city in which the voice of our brother has not resounded in proclaiming the evangel of his Lord. With all this in view, how our brother is able to serve the Circuit with which he is connected, and particularly the Society of which he is a member, to such an extent, and in so many ways, is a constant marvel. Interested in many other societies, he is interested most of all in his own. He is the leader of a flourishing class, and at present secretary of the new building effort at Beeston Hill. His connection with so many other churches has given our Beeston Hill Society special advantages, for thus avenues of financial help have been opened which would otherwise have remained closed. Friends have assisted in glad appreciation of his willing service. He has ever been the true friend of the young. He seldom conducts a service without some reference to the hopes and possibilities of young people. From the beginning of his Christian activities he has manifested a rare delight in the musical part of the Christian service. In his boyhood his father was choir-master at Lemington, and his sons sang and played their violins by his side. One cannot wonder that his sympathies flow in this direction still. His is a high ideal of what the Christian service of worship should be. Believing as he does in the spiritual value of each part of the service – the number of such believers steadily increases, a cause for thankfulness and hope – it has always been his ambition to perfect as far as possible the musical arrangements. Mr. Nichol is a most persistent Temperance worker, both at home and abroad. His addresses on this subject never fail to produce lasting impressions. In spite of all discouragements he has never wearied in the work. The hope lives in his heart, as in many others, that one day the gigantic foe of drink will be for ever crushed. Alongside all this, there is running in our brother’s life a perennial concern in civic life. Although his work is being done in connection with the organizations of the Church, yet there is in him a most anxious interest in the well-being of the city as a city. His influence is thrown whole-heartedly on the side of any movement which makes for the sweetening and purifying of society. In all our friend undertakes there is the unstinting abandonment, the sympathetic straightforwardness, the moral earnestness of a great soul. The grip of his hand is a real inspiration – the grasp of a man laying hold of the heart. Preacher, leader, worker, as he is, he has not gone unhonoured. It has been mostly the finest of all honour – that of increased opportunities for usefulness. His brethren have sent him as a delegate to one Conference and to two District meetings. For some years he was one of the secretaries, and is at present a vice-president of the Leeds Primitive Methodist Council. He is one of our Church’s strong, true, loyal sons, and the Church which owns him a little while honours him, and prays that a long day of gladsome service may yet be the will of Christ for him. William’s parents were William J. Nichol and Elizabeth. William, senior, worked the land. Whilst in Gateshead, William worked as a glassmaker. 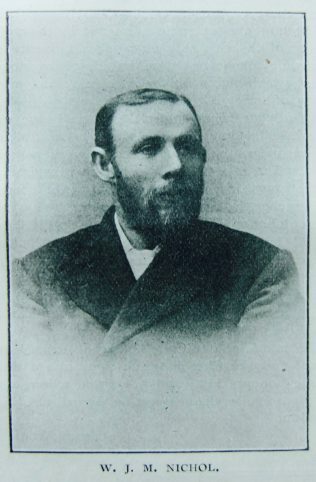 The 1891 census describes William as a manager of a refreshment house in Leeds. William married Hannah Bewick (1858-1880) in the summer of 1877 in the Newcastle upon Tyne Registration District, Northumberland. He married Janet Morris (abt1850-1926) in early 1883 at Gateshead, Co. Durham. Census returns identify three of four children. William died on 21 July 1920 at Leeds, Yorkshire.